Each of these principles contributes to the overall success of your space. Today we will be focusing on details, or the little things in a space that add life and interest to it. Details are what really set your room apart from others. It is an easy and fun way to add your personality and uniqueness to a space! 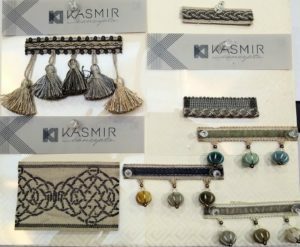 We carry a beautiful assortment or decorative trims for pillows and window treatments. This becomes the equivalent of “jewelry” for your space. Below are some examples of what we carry at Columbia Paint and Clarksville Paint and Design, a Benjamin Moore dealer. 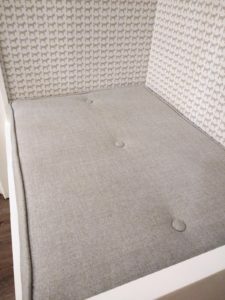 This mud room cubby features a custom tufted bench cushion by Kasmir as well as an Anna French wallpaper in a whimsical dog print. Both brands can be found in our design center. Decorative paint can be used as a detail as well. 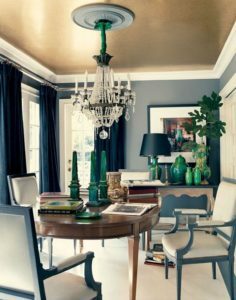 Note the shimmering gold ceiling in this dining room, as well as the eye-catching emerald accessories. If you are looking to add details and personality your space, come see us at Columbia Paint or Clarksville Paint and Decorating Design Centers for one on one assistance. We are a Benjamin Moore Paint and Fine Paints of Europe dealer, and have over 300 wallcovering and fabric books. We also carry rugs, window coverings, and everything you need to paint your space.